The recently discovered matzevah or ha-tziyun, is this it? Every year a story is told about an 8 year old boy, a remnant in the line of King David who was anointed King over dwindling Judea. Inspired to correct the wayward worship of his Jewish people, King Josiah destroyed idolatrous altars and impure objects that had infused into Jewish practices since King Solomon built the temple in Jerusalem. During the turmoil the King hid the Ark of the Covenant, which has never been seen since. His successful efforts resulted in the most celebrated Passover feasts in Israel’s history. The nice story is recalled on the second day of Passover exclusively outside of Israel. However, the story was edited to exclude an intriguing, related prophecy some 300 years earlier. In the 18th year of his reign, King Josiah sent his royal scribe to advise the high priest that all donations must be used exclusively to restore Jerusalem’s aging temple. The high priest showed the scribe a recently rediscovered scroll that Moses himself had written. The King was most upset because the scroll was found open to the section describing Israel’s curses for disobedience including subjugation of the King and exile of the nation. Ignoring Israel’s senior prophet Jeremiah (a doomsayer), the King requested Huldah the prophetess interpret it, her report was ominous. Motivated to repent, the King marched his hierarchy into The House of Hashem (the temple denoted using the tetragrammaton) where he read them the open section of Moses Torah. He demanded the nation repent, perhaps to counter the ominous sign and the prediction of Hulda and previous prophets about the dire future of the City and its inhabitants. Everyone accepted his covenant and immediately set out on their national cleansing. The high priest was instructed to and removed false altars and all idolatrous objects from the House of Hashem. The King burned the idolatrous articles in the Kidron Valley (below the Temple) and had the ashes carried to Beit-El (House of God denoted without the tetragrammaton). He also dismissed the priests who had permitted these practices, burned the Asherah idol from the temple and ground the ashes to dust, which he scattered on the graves of the common people. He removed the Ark of the Covenant from its usual place and hid it. 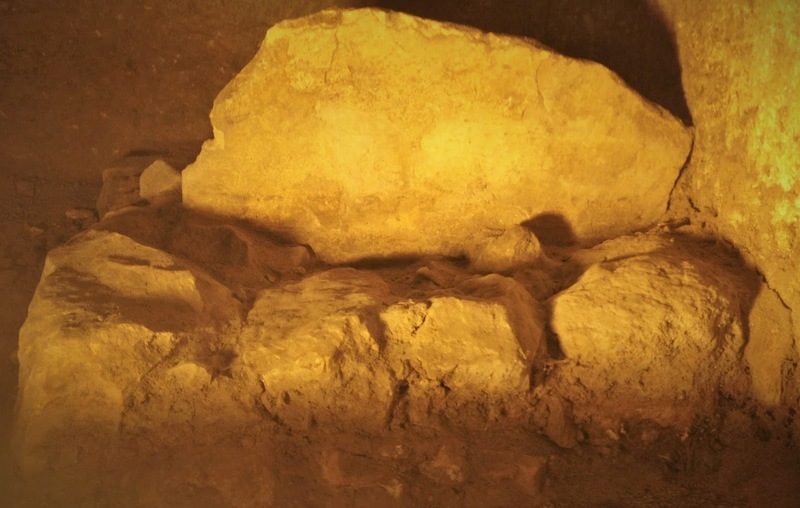 At this point the intriguing edit from the Passover passage ignores the gory details of idols that were destroyed and the prophecy: Also, the altar that was in Beit-el (denoted here with a small “e”) from the high place of worship set up by King Jeroboam (King of Samaria - 300 years prior), he destroyed and defiled with human bones. Then, an unlikely continuation the King asked “what is this tombstone I see?” The people of the city answered; it is the grave of the man of God who came from Judea and prophesied about the deeds that you have done upon the altar of Beit-el. The King responded, leave it alone! Let no man move those bones. His bones saved the bones of the prophet who came from Samaria. The story re-joins the Passover recitation when the King commanded the people to perform the Passover offering and continues to describe the celebration. Precision is the hallmark of Biblical script. Here the word tombstone (above) is written “ha-tziyun”, used once only in the entire 24 books of the Bible, an apparent alternative to the more common word matzevah. Deconstructing this earlier prophecy; the man of God from Judea usurped King Jeroboam with a prophetic proof that split King Jeroboam’s altar at Beit-el (in Samaria). But, on the way home the man of God prophet from Judea succumbed to the persuasion of a false prophet from Samaria. He disobeyed his instructions and was mauled to death by a Lion that sat peacefully with his Donkey. The false prophet buried the man of God in his grave and requested his sons bury him together in the same grave. King Josiah’s dueling true (Judea) and false (Samaria) prophets and exclusive reference to ha-tziyun, juxtaposes his Beit-El, Jerusalem (in the territory of Judah) defilements with his defilement of Jeroboam’s altar at Beit-el in Samaria (in the territory of Joseph/Ephraim). This was predicted by the man of God prophet from Judea who apparently did not come from Samaria, neither did the false prophet because he lived in Samaria , so what point was the King making? This edit and its powerful message must reflect confusion for the reader since the King destabilized aberrant Jewish communities and towns as well as foreign residents who had introduced their idolatrous practices. That confusion was amplified by the split Jewish nation who, at the time could worship Israel's traditional God or idolatry at the other altar’s of the temple and idolatry at Jeroboam's altar. The last-ditch attempt to unify Israel’s disparate tribes is said to be the reason prophet Jeremiah was absent when prophetess Huldah was consulted. The King buried the Ark of the Covenant a contradiction to his purifying, unifying mission. Although the King held hope, the writers choice of ha-tziyun over matzevah may be the most telling of all. The unique matzevah recently discovered on the high ridge above the Gihon Spring, in Beit El at Jerusalem’s City of David could suggest the retrospective state of national confusion, even to the King. This abandoned matzevah may have inspired the King to recall the prophecy before it was respectfully buried along with the ashes and broken idolatrous artifacts. Beit El and ha-tziyun at this location would mark the northernmost territorial boundary of Judea, which by tradition and Jewish law mark Israel's coalescent. On the last day of Passover outside of Israel, Isiah's Messianic prophecy is recalled. In it the jealousy of Judah and Ephraim will be subdued and peace between the warring nation of Israel will finally arrive. Looking at these two days external to Israel, we can imagine a time when the mystery of the true Beit El of Jacob (Jerusalem), a man of God from Judea who came from Samaria will finally be resolved.